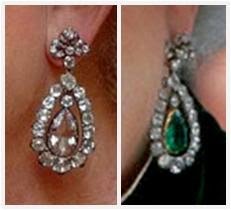 One of The Queen's more versatile pairs of earrings are these pendants, which can be switched from diamonds to emeralds. Each features a large hoop of single diamonds (creating a scalloped edge, which is how the earrings are described in Leslie Field's The Queen's Jewels) hanging from a detailed cluster of smaller diamonds, and surrounding a pendant which can include either a large diamond or a large emerald. I don't believe their provenance has been officially confirmed, but one eye-catching brooch of Queen Mary's may hold the key. The portrait above is sent to me often with inquiries about the jewels worn, either the necklace* or that intriguingly-shaped brooch in the center of her bodice. If you look closely at the brooch, the two sides seem to match the hoops used by The Queen as earrings. Queen Mary was typically pictured with small earrings, so perhaps she had a brooch made from a larger pair she wouldn't wear. That is merely my speculation. As for The Queen, she's used these earrings in their diamond format on many occasions, including a state banquet at the White House in 2007 (pictured above). In their emerald format, they've been used at the Order of the Thistle service and to accompany other emerald pieces like the Godman Necklace. They remain one of the larger pairs of earrings she still wears today. 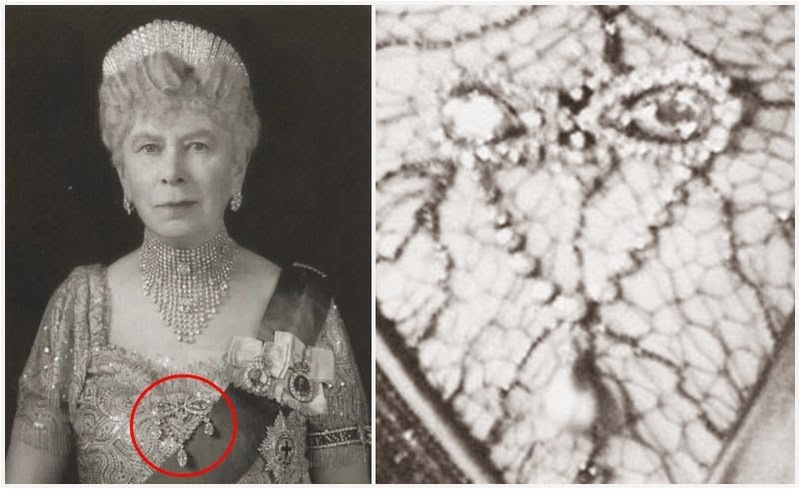 *Since the question comes up often: The necklace is commonly known as Queen Alexandra's Collier Résille, made for her by Cartier and worn by her and Queen Mary. It hasn't been seen since Queen Mary's days.